For quite some time now, Nicalis has been not-so-subtly hinting that Cave Story would be making its way over to the Switch. And while it may be the case that the game is available on loads of others platforms already—not to mention the fact that the game is literally available for free—it still stands to reason that there's a good chunk of people that would wish to pick up the game for the Nintendo Switch. If you happen to be in that camp, then today is a day to celebrate, as Cave Story has finally been confirmed for a release on the Switch. Cave Story will be releasing as Cave Story+ on the Switch, and it comes out (digitally and physically) on 20th June of this year. The port will run you $30, but it will supposedly be the definitive edition, with HD graphics, seven different modes (such as the Wind Fortress or Boss Rush), 10 unique weapons, and over 20 boss battles. No doubt a tempting offer to be sure, but the real question is: does it justify picking this game up again? What do you think? Have you played Cave Story before? Will you be interested in picking it up on Switch? Drop us a comment in the section below. A bit pricy considering I already played it on 3DS not too long ago. Physical version is very tempting though so I might still pick it up. Yes. Because it's a great game and its a physical release. Good news! Definetly getting it. Cave Story is as good as indie games get and as far as non-rpgs go its one of my all time favorites. OOOoooh I still want dis. Especially a physical cart. Never played the game before so this is definitely a buy from me. While I'm that one guy who thinks Cave Story 3D is the best version of the game, I'll totally pick this up when it launches (if I have a Switch by then). 30 seems a bit high, but I might give in if there's some truly enticing extras. I played the demo on Wiiware, but didn't buy the game because I didn't have enough space on my Wii. Then when I got my 3DS the price for a physical copy was off the roof (+80$us for a used complete copy). I am glad I will finally be able to get my hands on it this time. Must-buy for me. I'm going to poke around and see what this version looks like. If it has a nice update to graphics on switch I might pick it up. Otherwise I will more than likely pass. With that said.... I wish companies would bring out games from the past and update them on these new systems with HD graphic tweaks and maybe added surprises. Keep the gameplay we loved about the originals. This game seems to get love no matter what format it's in. They could do this with many other games. Just a suggestion. Imagine what they could do to Sonic 1 and other games. If I can find this physical, a must buy. @BenAV I can see Nicalis doing what did with The Binding of Isaac Afterbirth+ and release it with extras, like an instruction manual. Nevertheless, I'll definitely pick up a physical copy. The linked Nintendo Everything article doesn't have any sources, so this article should be labeled rumor, or at least unconfirmed. "20 boss battles, 10 unique weapons, and over 20 boss battles." You should mention that it has 20 boss battles! This will be my 4'th time I've paid for the game if I decide to get it again. If they can release some trailers showcasing the Switch port's unique offerings, I might be sold. Cave Story is such a fantastic gem. 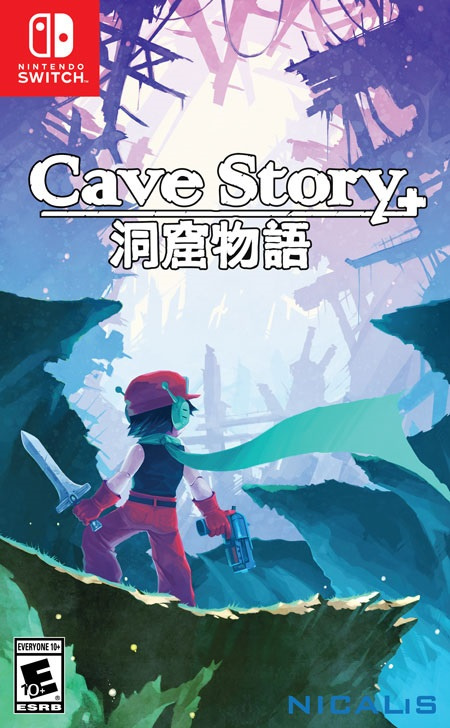 Ordinarily I wouldn't, but since Cave Story is in my top 5 games of all time I'll jump at the chance to get a physical version. Wow, I was really expecting a ton of enhanced remakes from Nintendo for the Switch but so far its been the indies rehashing everything but I guess it is a new console. I wouldn't pay $30 for many Indie Games. Lmao at that price and yet people still plan to buy it. Nintendo fanboys just like to get ripped off apparently. How many boss battles are there? So which is it, 20 boss battles or over 20 boss battles? Because it can't be both. Having the Wii version is enough for me. So I'm good. definitely getting a physical version, even though i alreday have it on wii and pc and megadrive. It's got 20 boss battles. Would be good to know which territories the physical release will be available for on June 20th (assuming its just the USA?). I've completed it only recently on my 3DS but would consider repurchasing for a physical copy here in Europe. Cave Story was made in 2004. At the time, an indie adventure like this made by one guy was extremely charming. Then the indie explosion happened, quality control ceased to exist, the market's been flooded, and Nicalis has ported Cave Story SEVEN TIMES prior to this one for the Switch. What do people think is so special about this one game to have it ported so many times? The charm is gone. Now it's just above-average in the sea of games by small-time developers. Let it die. Believe it or not, I still have not played Cave Story. I think I'll pick this up when it gets cheaper. I already have both 3DS versions of Cave Story so I don't think I'll be getting the Switch version. "20 boss battles, 10 unique weapons, and over 20 boss battles"
That's 2 times the same thing! A sequel is looooooong overdue! I bought the 3ds version recently, but still haven't played it. If not much else is out by then (e.g. VC) then perhaps I'll pick it up. Would rather have the retro graphics myself. Also any news whether the European release date is later? Usually is for Cave Story. I don't know if I'd be bothered enough with the hassle of buying points for the US eshop to get this if I already have it on 3ds. @MisterKorman kidding, right? Cave Story 3D was downright fully. I wonder is Tyrone Rodriguez EVER going to release Cave Story 3D in Europe. It's so weird that in the 3DS eShop the product page has been saying for six years now coming soon. The physical version of that is so rare that it's pointless to try to hunt it down. As a digital version I would buy it. I know it's the worst version of the game and I own Cave Story already on Wiiware, DSiWare on 3DS and PC, but it would be still fun to try it out. Pretty much only choice at this point is to get an emulator running on PC because I have no trust in Nicalis releasing anything in Europe for 3DS. Also, I'm pretty sure this Switch version will only be digital for Europe, so if European gamers want physical Switch games from Nicalis, you will have to order it from America. Nicalis doesn't put effort to European physical releases. Oh man!! $30? And physical release?? Have this factory sealed on my 3DS but still I'm sooo there day 1!! Glad to see a lot of indie games going retail on Switch!! Also the switch 2017 lineup seems to be slowly filling out on the retail side! Encouraging! @Kolzig that's weird, I bought Cave Story 3D in the Europe EShop years ago - you sure it's not there? I don't think I'm mistaken as I've never played the DSiWare version, to my knowledge. For me Nintendo UK's website says "A download version of this game is not available to purchase on this website." and that's always there when a eShop version is not available for download in Europe. In the 3DS eShop the game's page says "coming soon" if I view it on the console. @Kolzig my bad, sorry man, thought I was going to make your day! I thought I had Cave Story 3D but the screenshots don't look like the game I was playing, it was 2D but, if memory serves, had the stereoscopic 3D effect applied. Lmao at a great game that people want on their console and yet people still plan to be salty about it. Non-owning Switch haters just like to whine constantly apparently. Another old indie game trying to make a quick buck on the Switch. How can people not see what's happening here? Maybe tomorrow we'll get an announcement of Resident Evil 7, Mass Effect: Andromeda, Final Fantasy XV, Red Dead Redemption 2, etc, etc, etc? The day after? "... 20 boss battles, 10 unique weapons, and over 20 boss battles." Well said. How much do HD graphics really help a game like this, though? @SwitchVogel "20 boss battles, 10 unique weapons, and over 20 boss battles" sounds a bit weird. Maybe just "over 20 boss battles and 10 unique weapons" would be better? But "definitive" edition ? That's a really good joke. We'll talk about that in 10 years. "No doubt a tempting offer to be sure, but the real question is: does it justify picking this game up again?" Heck yeah! This is my favorite game of all time and any platform I have I will get it on to support my favorite Devs. Also to those who're complaining about the insanely reasonable price I have no idea what pricing you want. $30 is actually low considering the amount of content and heart put into this game. Also considering this will probably have achievements. It will have curly's story, and what wasn't mention is a remastered soundtrack. But to each their own. Very much yes. One of the all time greats and a physical release, huzzah! @switchvogel Would it be possible to get an official comment from Tyrone that will he ever release that Cave Story 3D digitally on 3DS and what happened to the original plans to release it in 2014 like Nintendolife even reported about it? So how many boss battles does it have? 20 boss battles AND 20 boss battles!? What a value! Never finished it on 3DS so I'll def be getting it on Switch. I love this game. I've never played it, so this is tempting. Never played this so will get the physical release. Another on the shopping list. might pick this up when it goes on sale at some point I only played the non + version on 3DS and really loved it, but I believe they added quite a bit of extras on the + version. Never played it but judging by people's excitement here, I'll have to pick it up. Question: I'm torn between physical and digital. Why do people prefer physical? I'm guessing it's easier to sell the games down the line? I wish we could have both so my Switch can have a ton of loaded games for traveling. When a game is just that good, I fail to see the problem. Yeah, you could sell it, but people buy physical to have something to hold and look at. Can't believe I'm actually considering buying this game again. I played the original version on 3DS and it got me hooked for a while. Tried the + version on steam, but didn't do the trick because it wasn't portable. Here comes the Switch then, but $30 is a bit much. Same thing with Isaac, I'll love to have it portable but $40 really? I've only bought this game once, and that was part of a Humble Bundle. Which I didn't buy for Cave Story, as I had already played it several years earlier when it was free and all that. I might consider this, both as a way of throwing som moolah Daisuke's way, but also as a way of committing myself to finally completing Hell. I'll withhold judgement until we see if there are extras, but this game is becoming the new Sonic 2. In a few years, they'll announce a port for microwaves. I've horribly misread this as "Cave Story launches for the 20th time in June". No h8 though, it will be the fourth time I buy it, and for that physical copy I'll have no regrets. @LowKeyLoki Gotta ask, do you buy this many copies of anything else, and if so, why? Kept forgetting to buy this so why not. I'll give it a go. So, to get this (and Isaac Afterbirth+) on cartridge, do we have to import from North America? Any news about plans from Nicalis for EU retail versions? Or should we adapt to an era of region-free gaming and just go import from everywhere? Because this, Afterbirth+, and also I am Setsuna are pretty high on my list. Want them on cartridge though. Any good sites from where to order those? Also, any detailed information on what is new in this version compared to Cave Story on WiiWare? Does it still have have the 2 graphics modes and 2 soundtrack modes? @Zebetite admittedly, me rebuying doesn't happen often, and doesn't happen at all without something to merit the purchase. About the only other time I can recall rebuying essentially the same game was Seiken Densetsu (Final Fantasy Adventure) of which I re-bought when it was remade as Sword of Mana on GBA, then Adventure of Mana on PSVita... and Street Fighter 2, though it's kind of cheap to mention that one being that it's the deadest horse to have ever been beaten... (I suppose I'll be buying that again on Switch too, no way I'll pay MSRP though). At the time, getting it on the Wii sounded like a good idea (I didn't get along with it on the Wii). The full remake on 3DS seemed like an interesting revision until I found out how poorly executed it was and how big of a problem depth perception and simply calculating movements were, but I did get my playtime worth out of it. The Steam version at the time seemed like the "perfect" version, but then the sprite-based Cave Story on 3DS went on sale and charmed me with faithfulness and a 16:9 aspect ratio. I'm buying this because I believe the physical copy and the Switch's versatility will add value to the experience. It's almost exactly the same in terms of gameplay, but I like the newer versions of the great songs from the original. The visuals look fine to me as well, though I understand people usually don't care for them, which I understand. Probably the best indie game there ever will be. I am ecstatic at the thought of owning it physical form, even if I only ever caress the sweet case. If my support of an "overpriced" game bothers you, than you can take solace that you will never succumb to a similar weakness for owning one of your favorite games and instead choose to chide those who do... Oh, good for you! By the way, it was previously announced this port will have Curly co-op and additional new content over a month ago. Bless Nicalis. @LowKeyLoki Fair enough, really. I was genuinely curious, thank you for answering my question. I have this on PC and the 3DS 3D version (French copy I found in switzerland cos damn that's become pricey in the U.K.). Yet have preordered this from my Canadian friends at VGP. Pity there seems to be no PAL release. Of course I will be purchasing it again! Depending on what comes out that month I will pick this up again, loved it on the 3ds. Would love to show support to Nicalis again as well. @Yasume I don't think it really a Nintendo fanboy thing his time. Cave story is not owned by Nintendo, but maybe it's is the indie fanboy trend. I really hated that too.